Nitegeka’s exhibitions make the audience conscious of the exhibition space; the audience member comes to form part of the exhibition this way. (…)Perception in a Nitegeka exhibition is significant to the extent that its extension related the audience member to the physical malleability of the gallery space. Serge Alain Nitegeka (1983, Burundi) had recently an exhibition at the Stevenson gallery. ‘Innate Black‘. This was my second encounter with Nitegeka’s work. My first encounter having been at the Stevenson a few years ago titled ‘Black Passage’. Comparing that exhibition with the one he had at the Marianne Boesky Gallery in New York titled ‘Personal Effects in Black’, one can discern the role of space as part of the politics of representation in the gallery white cube space. Like this exhibition ‘Black Passage’ was executed in a measure that relates the audience in a triad manner when interacting with Nitegeka’s work. 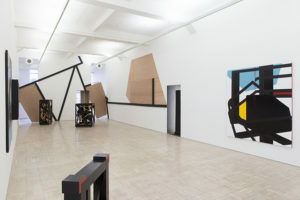 It becomes conscious of the interplay between wall floor and the cargo segments on the floor and the palpable connection between different rooms in the exhibition space. Making connections between these exhibitions help with the comprehension about the politics of curatorship and the limitations of the wall. In ‘Innate Black’ the focus is on the plywood pieces on the wall and the meaning of extending it in relation to a traditional perception of a gallery space. In an exhibition that continues the politics of representation within the white cube space of the gallery. Nitegeka raised questions about boundaries in the physical availability of the gallery space. Nitegeka achieved an exhibition in which the exhibition space operates with the ambiguity of collapse and stability. Nitegeka’s exhibitions make the audience conscious of the exhibition space; the audience member comes to form part of the exhibition this way. For example there were smaller doorways in ‘Innate Black’, they were not just small, they were few, only two. The traditional open floor created an open feeling for me. Unlike in ‘Black Passage’ where the cargo segments made the space confined. Nitegeka’s work creates the ambiguous function of expanding and constricting the exhibition space. 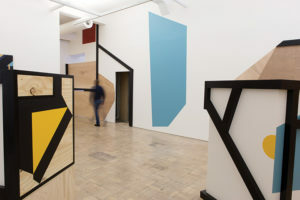 Nitegeka also exhibited at the Marianne Boesky Gallery in 2018, in New York where he created the same wood based canvas panels for the walls. One can discern the continuation of the entoptic forms and shapes that make up the wood panels on the walls. Portrait form of the piece titled ‘Colour and Form XXXVIII’ brings to mind the same vitality that the walls at the Stevenson are imbued with. 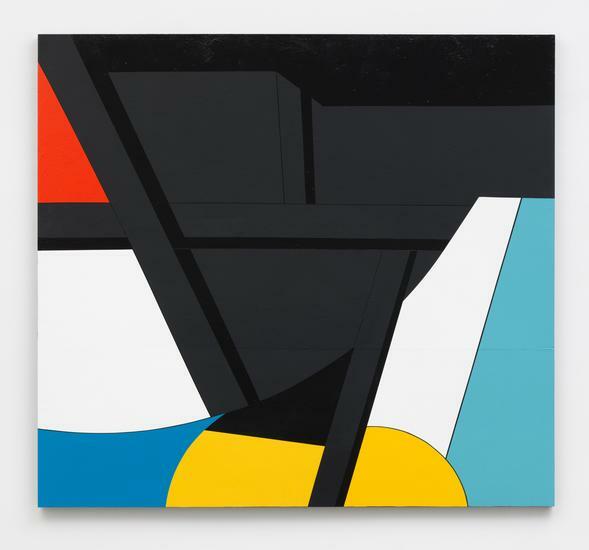 In ‘Personal Effects in Black’ at Boesky one can discern the inception of allowing main gallery spaces to be open instead of being occupied by the box panels. This way Nitegeka is able to demonstrate that the wall and the open are in a symbiotic relationship. In the exhibition ‘Black Passage’ space was constricted, inundated by the small boxes or segments placed around the floor. Some were see through and contained nothing. Others the artist put fragments of wood in. The function of space in Nitegeka is symbolic to the extent that it is cognizant it forms part of the physical implication of the exhibition space. The presence of arched doorways in ‘Innate Black’ operated in a similar symbolic measure. Pockets of space that demonstrated that it is malleable, that it can be extended. The box segments in ‘Black Passage’ are not doors, but ,like doors they are measures to extend perception. Perception in a Nitegeka exhibition is significant to the extent that its extension related the audience member to the physical malleability of the gallery space. This brings to mind the gallery wall, the floor and the creation or invention of alternative spaces. The doorways in ‘Innate Black’ operate in a measure that opens up and extend the notion of a gallery wall. 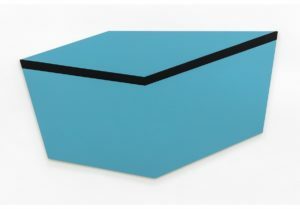 The box segments created the impression that space and perception can be extended by containing it in a palpable way. In ‘Innate Black’ this palpable feeling of being confined was achieved by the small arched doorways that characterised the space I interacted with. It had two narrow doors that connected three rooms, one with plywood wall pieces, the second was an adjoining room that turned into a cul-de-sac corner characterised by unpainted plywood next to the blue and black ones. The third room which could be seen from the first room through the narrow doors is painted completely red. The ability to create spaces that induce ambivalence which induces a feeling of openness and being confined. Other than the uncharacteristic small arch doors, the focus on the walls released the feeling of confinement I experienced in the first three rooms. 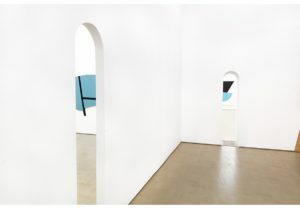 Through a third small arch door that led into the bigger white cube main space in the gallery pronounced the focus on the plywood pieces on the wall. 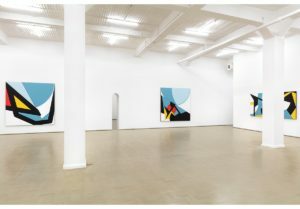 What is unique about Nitegeka’s work is that it added a dimension into the flat two dimension of the gallery’ wall. Since he interacts with the wall this collage effect interacts with the wall in a measure that created an effect that the works are immobile and etched on the wall. 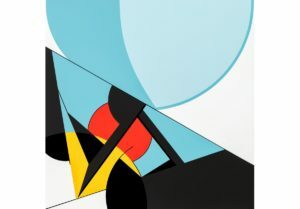 Like the piece titled ‘Colour and Form LXV’, the effect had the impact about the dynamics of power and representation in the context of the white cube space. In a somatic sense the ability or lack of ability to remove images from the wall plays into the capacity for the artist to demonstrate how physically flexible the cube space is. It also plays into the capacity for curatorial choice as a premeditative facility either for thinking within the confines of a white cube space or thinking outside the confines of the cube space. The first space or room that one interacted with was characterised by sparse almost plain blue plywood pieces. These pieces laid the intellectual foundation for the three dimensional operation of the wall based pieces unlike the two dimensional suggestion of the ability to remove pieces on the wall. 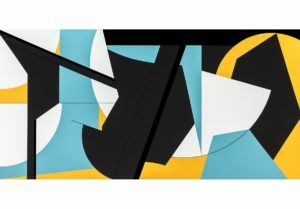 The piece titled ‘Form Ephemeral VIII’ which is a piece that suggests a square box with black thin plywood framing the top. Pronounced this ambivalence between the capacity to politicise how pieces on the wall are curated and their temporality on the wall. Nitegeka was able to articulate what was skeletal in the bigger exhibition space and what was skeletal about a piece like ‘Form Ephemeral VIII’. 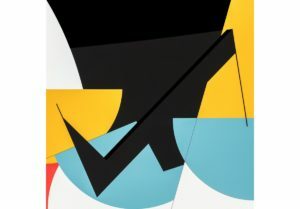 Form Ephemeral XII, at Stevenson, 2018. 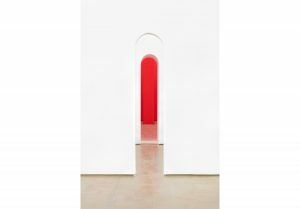 A piece like ‘Form Ephemeral XII’ continues the discourse of the play between spaces by creating a form the same size as the arched doors. Only with this piece he closed the arch with plywood and accompanying thin plywood. The discourse of access, dimensionality, plus the capacity to remove or lack of capacity to remove pieces became infused with the discourse of boundaries. Boundaries are facilities that characterise a somatic relationship between the curatorial choice and how the audience interacted with the exhibition. 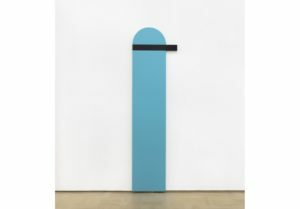 Through the strategy of the doorways or the suggestion of a doorway, Nitegeka created a piece in which the symbolic function of the wall is not just limited to perspectives or the consideration of an audience member’s comforts for perception. It is a piece that demonstrated that perspectives are insouciant and mobile. The choice of creating pieces that are hard to remove from the wall formed part of the discourse about curatorship occupying the same premeditative function executing the work in the artist’s studio.